You will find all the official information for the RS Feva Eurocup and the Hungarian RS Feva Fleet Race 2018 here. You can download the NOR of RS Feva Eurocup Hungary 2018. Organizing Authority: Vitorlázó Gyermekekért Egyesület (VGYE) in association with the Hungarian RS Feva Class Association (HRSFCA) and the Hungarian Yachting Association (HYA). Venue of event: International Sailing Center, Zákonyi F. u. 8., Balatonfüred, Hungary. 1.1. The regatta will be governed by the rules as defined in the Racing Rules of Sailing (RRS). 1.2. No national prescriptions will apply. 1.3.The racing rules will be changed as follows. 1.3.2.RRS 44.1 is changed so that the Two-Turns Penalty is replaced by the One-Turn Penalty. 1.3.3. RRS 63.7 is changed so that in the event of a conflict between the Notice of Race and Sailing Instructions, the Sailing Instructions shall prevail. 1.3.4. The changes will appear in full in the Sailing Instructions. The Sailing Instructions may also change other racing rules. 1.4. [NP] denotes a rule that shall not be ground for protests by a boat. This changes RRS 60.1(a). 1.5. [DP] denotes a rule for which the penalty is at the discretion of the International Jury. 3.1. The regatta is open to all boats of the RS Feva XL Class. 3.2. Class Rule 3 “Class Association Membership” of the RS Class Rules applies for eligibility to compete in this event. 3.3. All boats shall hold insurance against third party claims as referred to in clause 17. 3.4. All crew members shall be members of a Yacht Club recognized by a National Authority. 4.1. Entries shall be sent to the Organizing Authority online or by e-mail. E-mail address: office@rs-sailing.hu; Online registration link is on the event website: http://rs-sailing.hu/registration/. 4.2. Entries are valid only if the entry fee has been paid. 4.3. The entry fee is Euro 140 p. boat. The entry fee includes usage of the marina for the duration of the event, the parking of trailers and the social programs for the crews. 4.4. 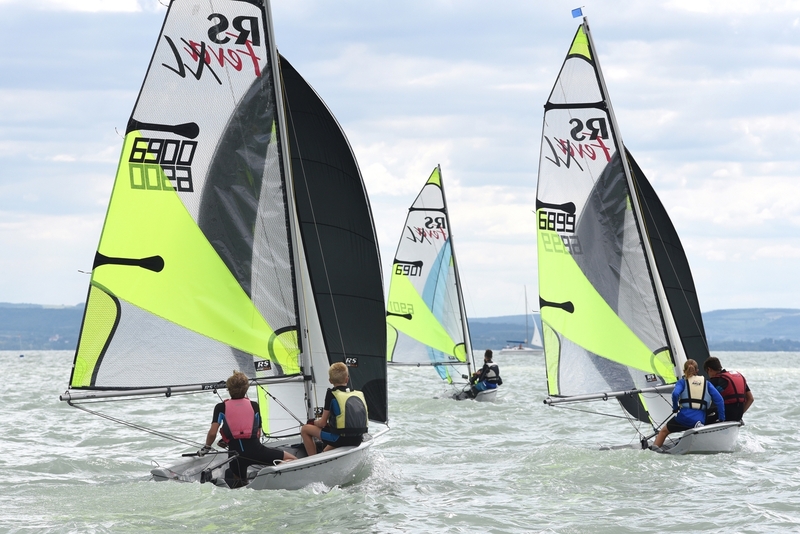 The registration fee for support or coach boats is Euro 160, that includes craning in and out, the temporary license for Balaton, berthing fee in the marina and entry for social programs for one person for the duration of the event. 4.5. The entry fee shall be transferred to the bank account below until May 31st 2018 the latest. All transfer charges shall be carried by the entrants. Late entrants shall pay a fee of Euro 180 per boat payable in cash at the registration, as given in the program. 4.6. Cancellations shall be made in written form. If a confirmed entry is cancelled before May 31, 2018 2018, Euro 100 p. boat will be refunded. In case of a cancellation after May 31, no refunds will be made. 5.1. Registration takes place at the Race Office in the premises of the International Sailing Center in Balatonfüred as indicated in the program. 5.2. The boat’s entry will be finalized on completion of the registration. Following documents shall be displayed upon request. 5.2.1. A valid measurement certificate of the boat. 5.2.2. ID card of all crew members. 5.2.3. A completed Parent’s / Guardian consent form signed by the responsible parent or guardian for all competitors aged 18 or under on August 2nd 2018. Forms are available for download on the homepage of the International RS Feva Class. 5.3. A declaration about holding a third-party liability insurance of at least Euro 1,000,000 shall be signed by the boat owner’s representative. 5.4. A disclaimer of liability shall be signed by the person in charge of the boat (RRS 3.4). 6.1. The International RS Feva Class Association reserves the right to nominate a represen-tative to scrutineer competing boats before and during the regatta to ensure compliance with the class rules. 6.2. Boats may undergo random checks during the event and shall conform to the Technical Committee’s instructions. 6.3. Equipment as defined in the Class Rules shall be on board while racing. 6.4. The Race Committee may check if registered crew members are on board while racing. 7.1. There will be one series in one fleet. No first warning signal will be made after 15.55 on Sunday. Prize-giving ceremony: right after protest time limit or hearings. Sailing Instructions will be available at the registration. 10.1. Races will be sailed on a windward-leeward course with a gate leeward and leeward finish. 10.2. Target time of the races is 40 minutes. 10.3. Racing area will be in the area marked by Balatonfüred, Alsóörs, Siófok and Zamárdi. 10.4. Details of racing area signalling, marks and courses will be defined in the Sailing Instructions. 11.1. One race is required to be completed to constitute the series. 11.2. When fewer than five races have been completed, a boat’ series score will be the total of her race scores. 11.3. When five or more races have been completed, a boat’ series score will be the total of her race scores excluding her worst score. 12.1. Combustion engine driven power boats are not allowed to drive on Balaton due to environment protection laws except for with a special licence. [NP] [DP] 12.2. Boats with support persons may apply for such a temporary licence at the Organizing Authority according to the terms in clause 4.4. Applications shall be sent to the e-mail office@rs-sailing.hu together with the boat’s documents, insurance certificate and the driver’s boat driving licence no later than June 31st, 2018. The application document is available online here: http://rs-sailing.hu/coach-boat-registration . [NP] [DP] 12.3. All boats with support persons shall register during the registration period, present a valid Third-party Insurance Certificate and be issued with an identity flag or sticker, such flag or sticker to be worn at all times when afloat. The person in charge of the competing boat shall acknowledge the presence of a boat with support person on his registration form. [NP] 12.4. In the event of an emergency the Race Committee may request boats with support persons for their assistance. 13.1. An International Jury will be appointed in accordance Appendix N, from which there will be no appeal (RRS 70.5). 13.2. Arbitration according to RRS Appendix T will be used. 14.1.The first boat will be awarded a trophy. 14.2. The crew of the first three boats will be awarded medals. 14.3. Other prizes may be awarded. 15.1. Boats shall be kept in their assigned places in the boat park. 16.1. Competitors participate in the regatta entirely at their own risk. See RRS 4, Decision to Race. The organizing authority will not accept any liability for material damage or personal injury or death sustained in conjunction with or prior to, during, or after the regatta. 16.2. It is for the boat to decide whether she is fit to sail in the conditions she will find herself. By going to water the boat confirms that she is fit for those conditions and her crew is competent to sail and compete in them. 16.3. All owners/persons in charge who sign the Entry Form are deemed to have made a declaration that they hold third-party liability insurance as required by the Notice of Race. Competitors are also advised to effect their own personal accident insurance. 16.4. The Hungarian Yachting Association, the Hungarian RS Feva Association, Vitorlázó Gyermekekért Egyesület, the Principal Race Officer, the Race Committee, their employees or agents or sponsors, shall not be responsible for any loss, damage, death or personal injury, however caused to the Owner/ helmsman or crew, as a result of the boat taking part in the racing. 17.1.Each participating boat shall be insured with valid third-party liability insurance with a minimum cover of Euro 1,000,000. 18.1.Boats and support boats shall use harbour facilities as instructed by the Harbour Master. [NP] [DP] 18.2. The organizers cannot grant parking places to participants inside of the Harbour. Cars may use the underground garage opposite to the harbour or they may park for free at the public parking place in Huray utca, Balatonfüred. 18.3. It is allowed to drive in into the harbour’s area with the trailers, however cars shall leave immediately after offloading the boats or two hours which ever is earlier. When leaving, cars are allowed to drive in for the time necessary to pack the boats. 19.1. All participants acknowledge that there may be film or photo shootage about the regatta, sailing in and out of the harbor, programs on water and ashore that may include scenes with the participants being visible. 19.2. The organizers shall not be limited in any way to use, publish, copy, sell or give to third parties these films and photos – as far as they do not infringe personal rights. 19.3. By registering for the regatta, the entrants and participants do explicitly renounce on any relating demands, damage or compensation claims. 20.1. Further information is available on the website www.rs-sailing.hu Social programs will be announced in a separate document. 21.1. For further information on how to charter a boat, please contact office@rs-sailing.hu. Charter boats are available for collection from 27 July 2018.